Biedermeier is a short, clearly definable period circumscribed by the year 1815, the end of the Napoleon Wars, and 1848, and the year of the European revolutions. The most significant achievements of the Biedermeier period were in the sphere of furniture design, and it was in this connection that the name 'Biedermeier' was also first introduced to indicate the style. Particularly around 1900, Biedermeier was considered to represent the quintessence of interior decoration. The comfortable but nevertheless unpretentious middle-class standard of living was above all reflected in the living rooms. The Biedermeier style of living was pleasing, often also elegant, but never exaggerated and opulent. 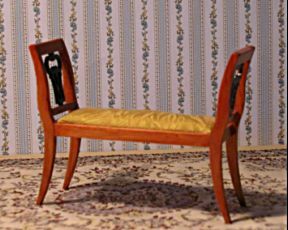 Biedermeier furniture was designed with the object of being serviceable, comfortable, utilitarian and functionally unobtrusive. Particular emphasis was placed on good materials and craftsmanship. Commodes and cupboards have plain, unpretentious lines but are beautifully veneered and inlayed. In most cases, birch-wood, ash or cherry-wood was used carefully polished. The Biedermeier style gave a decidedly comfortable impression. The sofa against the wall formed the predominant group in the room. In front of this the round or oval dining table with several light and welcoming chairs with divided back rests and curved legs were arranged, the seats had horsehair upholstery and were covered with striped or floral materials. The Biedermeier was a communicative period; the writing of letters belonged to the most important daily activities. Consequently, and important role was played by the bureau, the 'writing cabinet', with its wide base drawers, the large desk leaf, concealing the innumerable small drawers when closed, and reducing the size of the otherwise projecting piece of furniture. No contemporary living room was without the glass cabinet in which all the beautiful glasses, cups, figures and souvenirs were displayed.